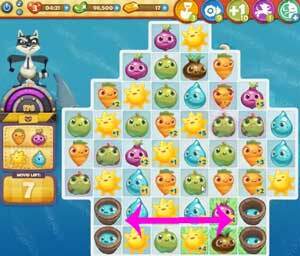 These Farm Heroes level 599 cheats and tips will help you beat level 599 of Farm Heroes. 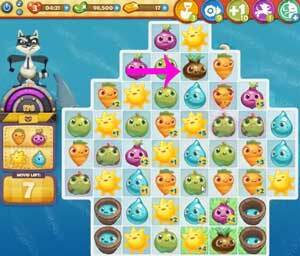 The objective of Farm Heroes level 599 is to defeat Rancid the Raccoon in 16 moves with carrots, onions, suns, and water drops. The easiest way to hurt Rancid is by flooding the board with water. 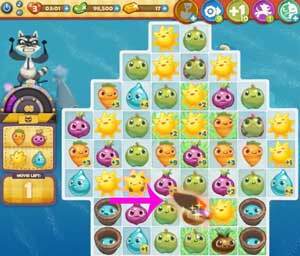 Once you start a water cascade, it’s hard to stop it! Make lots of moves next to the water buckets to fill them up quickly and load up the board with water that will hurt Rancid. Level 599 will give you several grass seeds to work with. Get them next to water drops and match them to grow five squares of green grass. Try to grow grass in the center of the board to take up as much room as possible. Lots of cropsies that fall through the board will get extra points this way. You’ll only have a few moves to work with in levle 599, making this one of the toughest Rancid levels yet. To counteract this, use the magic shovels to trigger cascades. Don’t just dig up cropsies with high point values unless you’re within a few points of victory.